No trip to Key West is complete without a dive into the beautiful blue waters surrounding the islands. 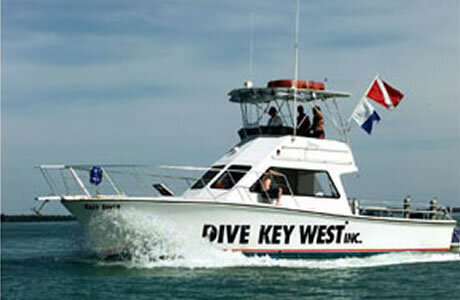 Dive Key West is a full service dive facility that has been operating in Key West for forty years. The company's experienced staff are ready to help you rent the gear you need and get out on the water on a chartered dive cruise, whether you're new to dive or you've been doing it for years. If you prefer to just snorkel and stay away from the deeper parts of the water, you can do that too. Never been diving before? Dive Key West offers a one day resort course under close supervision, followed by a scuba certification course which you can take in 4-5 days. There are also refresher programs for experienced divers who haven't been out in a while and advanced courses for intermediate divers who want to plumb greater depths. Dive sites Dive Key West charter boats visit include Joe's Tug, the Cayman Salvager, and the Vandenberg. These are intermediate to advanced dives. You can also dive or snorkel in the inner and outer reefs which are shallow in depth and perfect for beginners. Night dives are also offered so that you can meet some of the nocturnal residents of the Key West reefs including crabs, lobsters, and coral polyps. Trips are also offered in the mornings and afternoons. Dive Key West's boat is called the Easy Diver, which parks at the Key West Harbor Yacht Club, a facility with a full range of amenities including a restaurant and bar, pool, gym, sauna, and showers. The company's 4000-square-foot dive facility is located on U.S. 1 and has convenient free parking for unlimited hours. Reviewers indicate that staff members made their dive trips safe and enjoyable, and that they were very happy with their experience.